Designed for Atlas Holdings LLC in Greenwich, CT. 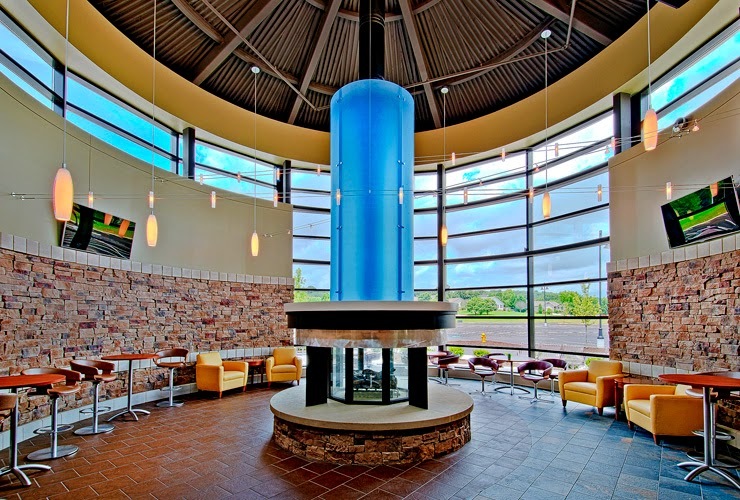 This fireplace was engineered to product a tall, lazy flame, and designed to fit into a modern corporate office. Acucraft has specialized in designing See Through Wood Fireplaces for over 20 years. 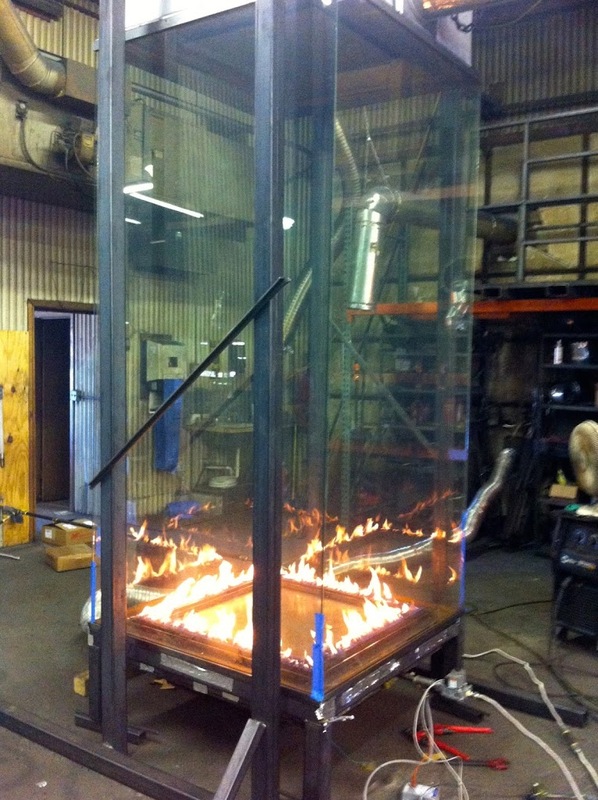 We have 24 key ratios in every See Through Fireplace we make. See Through Wood Fireplaces are a great way to have a fireplace in two rooms or separating a large room with one flue system. Many clients enjoy the exposed flue because it takes less visual space and is cost effective. Acucraft provides class A flue for exhaust and clients will either paint the flue or wrap in their own noncombustible material. The See Through Wood Fireplace allows air within your home to enter into the two bottom louvered vents. It becomes heated by the system, as well as the insulated panel enclosure. The heated convection air rises and circulates out two top heat vents. One side of the See Through Fireplace has two control handles; one for the damper and one for the combustion air. The combustion air enters at the top of the doors providing an air wash. The air wash is designed to keep clean outside air coming across the glass. We call this the Great Room Side. The other side has one control handle, controlling the combustion air entering on that side of the fireplace. The damper controls the burn time and the combustion air controls the amount of heat. Acucraft’s See Through Fireplaces give you total control of your fireplace from fully open to fully closed. All Acucraft Fireplaces come with two 220 CFM blowers with variable speed control, which provides additional control over the speed of the heated airflow. The blowers arrive installed; many clients will install the variable speed control box on the outside of the fireplace or an interior wall. Please contact an Acucraft Selection Specialist today with any questions about the See Through Wood Fireplace with Exposed Flue. Acucraft’s goal is to revolutionize the fireplace industry through excellent customer service, and unique custom solutions with a collaborative design concept (CDC). Working directly with our customer’s to fully identify the vision and concept while incorporating Acucraft proven designs to create the absolute best finished product. Acucraft’s concept in creating the Blaze 10 Gas Fireplace is to offer a large viewing area, beautiful flame, and many design options all at a great value. “Air Shield” – patent pending – additional pane of glass extending 1″ from front of fireplace supported by brackets allowing room air to cool the glass. Porcelain Reflective Panels – can be installed in the back,sides, and top of the fireplace. Acucraft internally tests each fireplace before shipping. Please contact an Acucraft Fireplace Selection Specialist at 763.263.3156 or info@acucraft.com to receive any additional information on the Linear Gas Fireplace – Blaze 10. 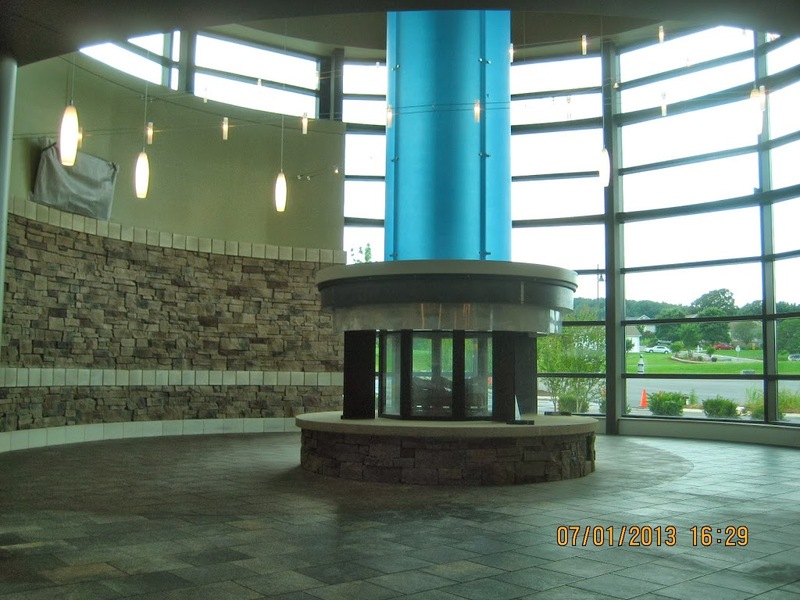 The above image is the completed Custom Multi-Sided Gas Fireplace located in the Voice of Evangelism (VOE) in Tennessee. VOE’s Architect contact Acucraft and requested a custom fireplace design that would be located in a circular room being viewed from all angles. The drawing below was the original vision VOE had presented to Acucraft’s Design Team. Acucraft Fireplaces enjoys working directly with the customer, Architect and Designer to create a unique one of a kind fireplace. We called it the Collaborative Design Process. Acucraft Design Team reviewed the vision from VOE and presented three different options with pricing. This blog tells the story of the VOE / Acucraft Collaborative Design Process. The original design concept was to have a round fireplace with round glass panes. Through discovery calls betweeen Acucraft and VOE via WebEx, VOE decided they would be interest in receiving three different concepts from Acucraft. With option two and three meeting the concstruction budget, VOE decided to proceed with these design options. The Acucraft design team began bringing the two designs to life, which you will see below. After further collaboration with VEO on the 4-Sided and 8-Sided Custom Design concepts, a decision was made to move forward with the 8-Sided Custom Designed Gas Fireplace. 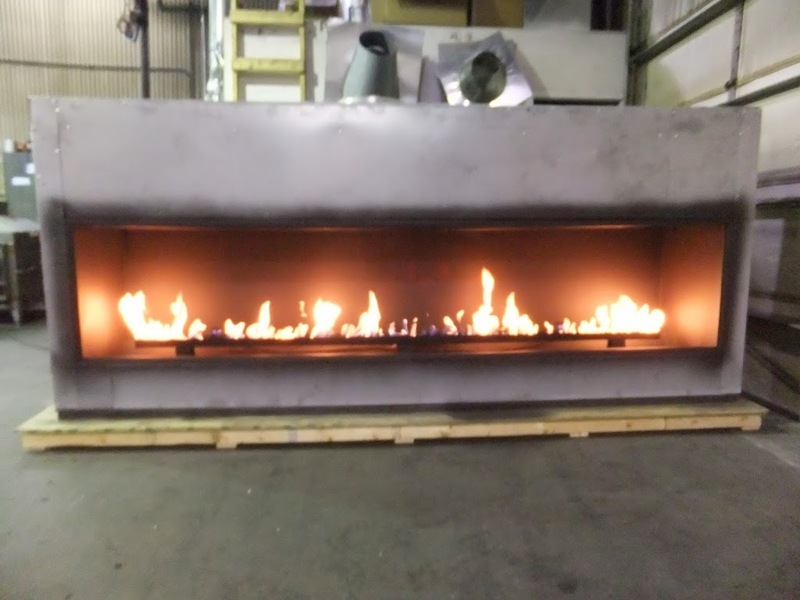 Once Acucraft’s Design Team receives approval from the client on submitted drawings, our fireplace designers create a complete set of shop drawings for our fabrication team. 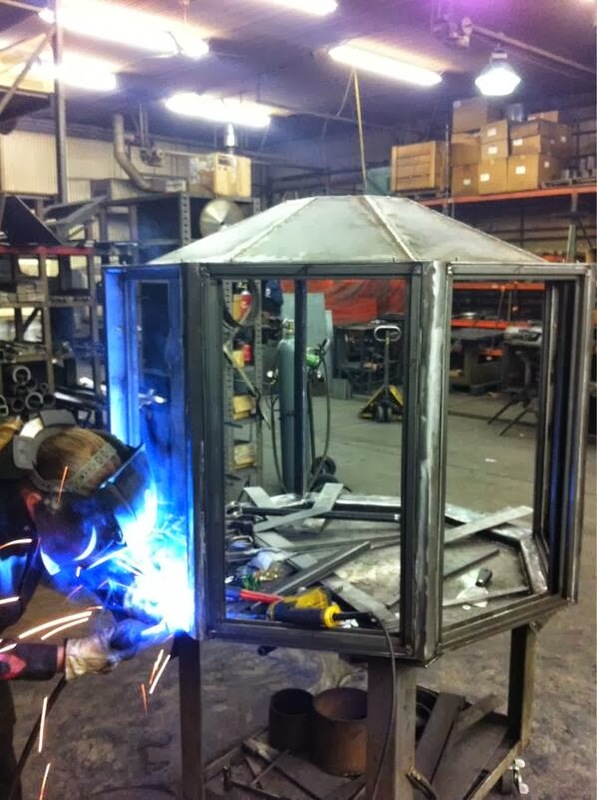 All Acucraft fireplaces are build on site by skilled welders and metal craftsmen. Below you will see the 8-Sided Custom Design Gas Fireplace in the making. Acucraft internally tests every fireplace prior to shipping. Below you will see the Custom Multi-Sided Gas Fieplace being installed on customers site. All Acucraft Fireplaces have the fireplace gas control externally mounted to keep a clean look around the fireplace. 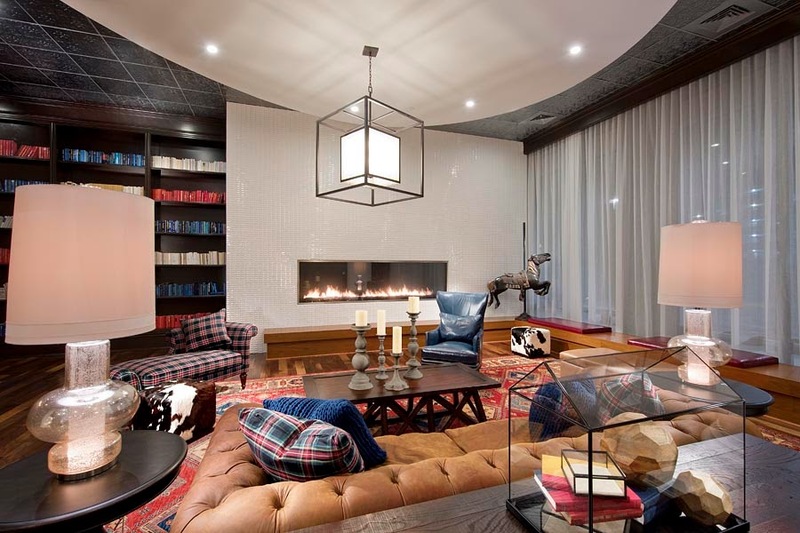 Through the Collaborate Design Process, Acucraft was able to present VOE with a Custom Multi-Sided Gas Fireplace that was able to exceed the customers expectations while meeting there construction budget. 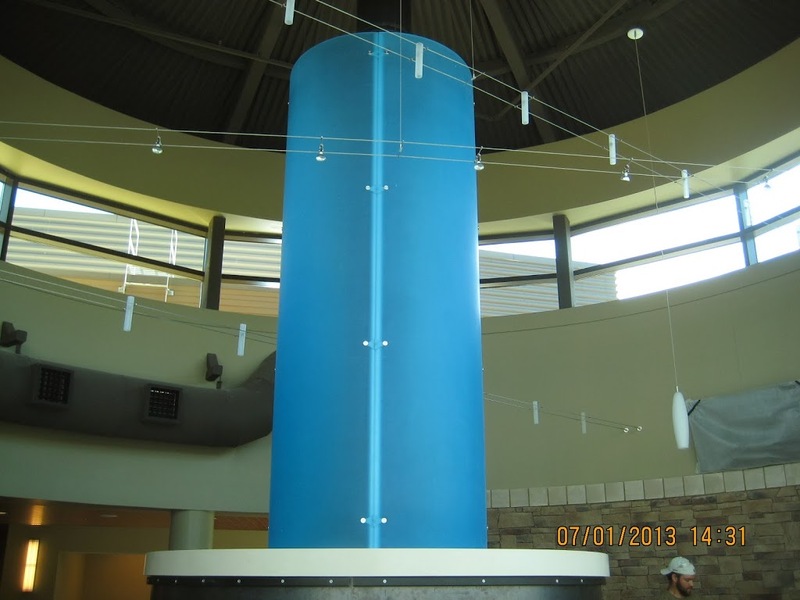 Credits to Voice of Evangelism (VOE), Trinity Architects, and Denark Construction. We recently finished building and testing a very tall, all-glass fireplace. The viewing area is 8 feet high and made only of glass, no steel or structural supports are needed. With a total system height of 11 feet, the all-glass surround still gives the fireplace a very elegant look. Notice how the flames are reflected in each pane of glass, and beyond. The height of the glass allows the reflections to extend further than what is typical for an all-glass fireplace. The tube steel shown in the photos is only being used to support the hood during testing in our facility. When installed, the hood will be secured inside the ceiling and very little steel will be visible above the glass. Because the hood is secured within the ceiling above, there is no need for any structural supports, maintaining the clean, unobstructed view. The ventilation system, designed to exit the hood on the side, can be vented horizontally or vertically. 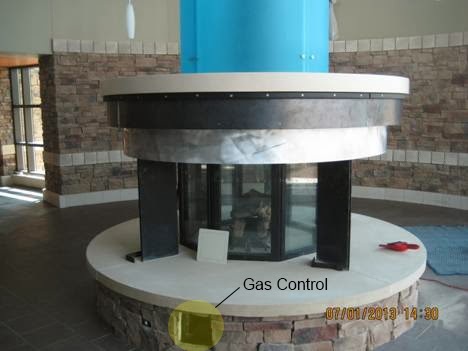 The square burner is centered within the glass structure and the entire base can be covered with glass media or river rock. Shown below is a drawing of Acucraft’s “Glass Tracking System”. Recently developed by an Acucraft designer, the system holds the glass in place and makes it easier to tilt the large glass panes in and out. In addition to ease of installation, the system allows for a very clean look around the base and top. The following fireplace is for a home in Idaho. It is important to the customer that the fireplace be short enough to fit below a window looking out over the mountains. To make this possible, we are running the flue out the right side of the fireplace, bringing the air intake in through the left side, and positioning the heat relief slot on top. 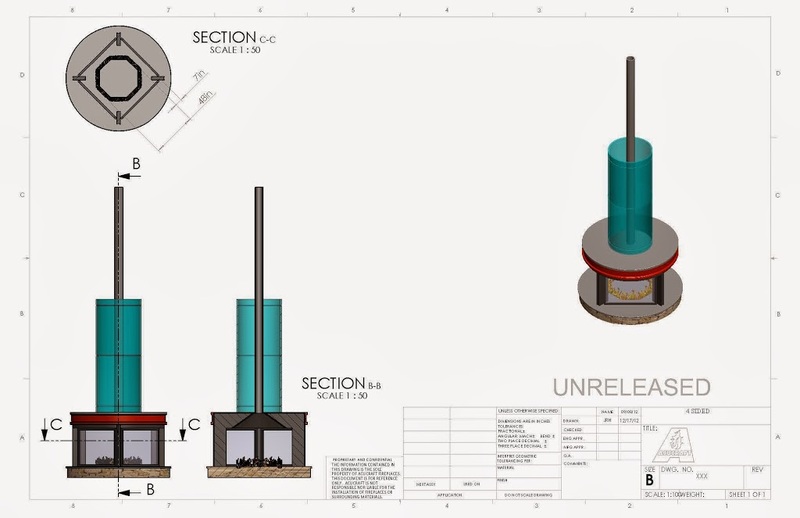 The fireplace blueprints are pictured above – prepared by the Acucraft design team. The above photo is from the site in Idaho. 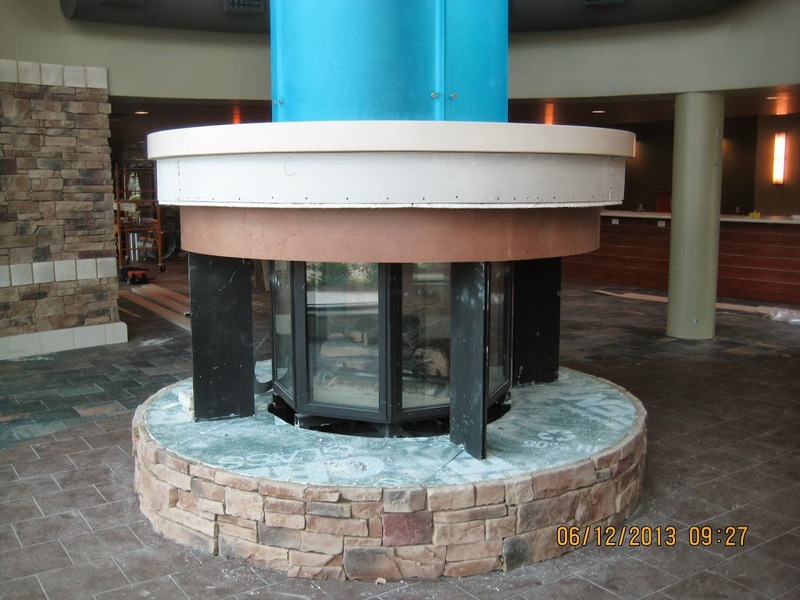 The structure was prepared by the builder to help show the clients what the custom fireplace will look like when installed. 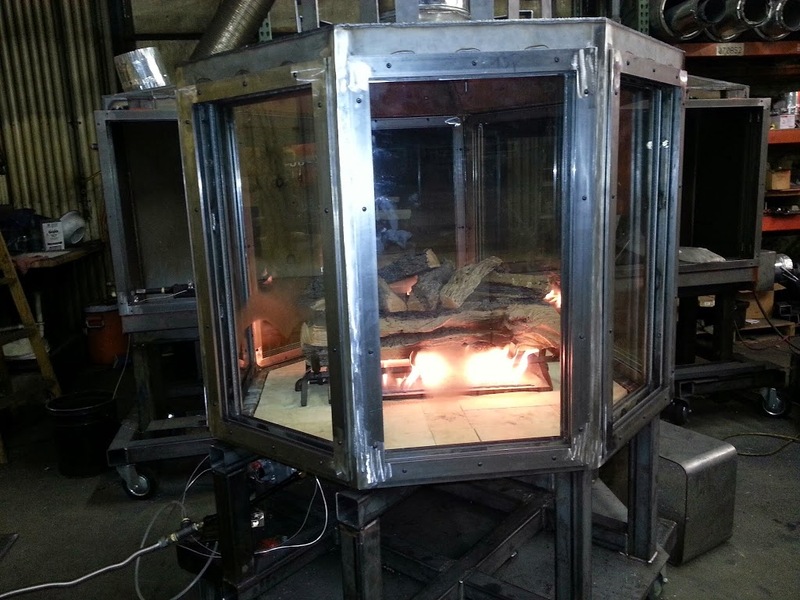 We test fire all of our custom gas fireplaces to ensure optimal performance prior to shipment. Below is a photo from a recently completed project at a Grand Hyatt Hotel. In order to stack the custom linear gas fireplaces, we vented the system out the side and created a structural support to hold the fireplaces to the wall. 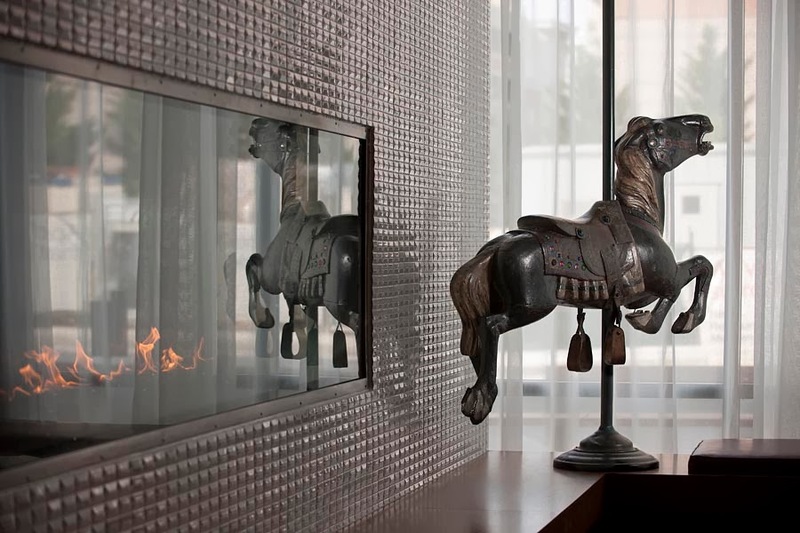 The above sketch (credits to Ann and Ken from Cleo design and Mike from Klai Juba Architects) was the original vision presented to Acucraft for a fireplace in a casino steakhouse patio with a retractable roof. 1. A viewing area height that would not obstruct the view across the patio. 2. The ability to attach a steel cladding enclosure to the panels outside the viewing area. feature made traditional venting impossible). 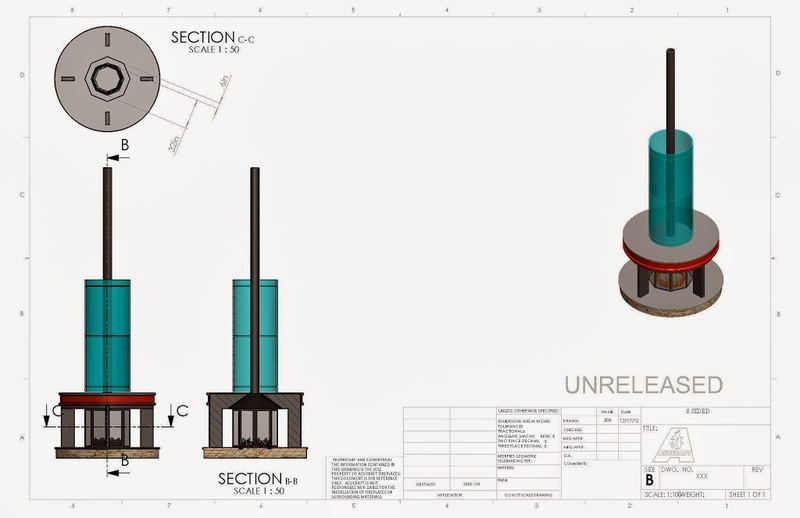 The animation below, created by Acucraft’s design team, was presented to the client. Below are 3D renderings created by Acucraft designers based on the initial vision of the casino’s architects and designers. Below are the blueprints for the custom see through fireplace. The fireplace fulfills the vision cast by the designers and architects, adding to the overall experience in the casino and steakhouse. Special thanks to Mike at Klai Juba Architecture, Ann and Ken at Cleo Design, Frank at The Cordish Companies, PPE Casino Resorts, and Sebastian at Commercial Interiors. "I had another efficient fireplace in my old cabin and one of my favorite differences between the two homes is my Acucraft. I love it and we use the fire screen every morning when we are having coffee and I never could have done that with my other fireplace."